On July 20, 1969, the eyes of the world were on an event that would change humanity. Millions of people excitedly waited for Apollo 11 to make their historic landing on the moon. However, as big as the event was worldwide, the Kennedy clan would once again occupy the front pages of the newspaper. This time it was Ted Kennedy, who was senator of Massachusetts and hoping for a bid to the White House that made headlines. Sadly, fate wanted his opportunity of becoming president sunk in the bottom of a lake next to the corpse of Mary Jo Kopechne. Throughout the past decades, people have wondered what exactly occurred on the night of the Chappaquiddick incident. Many people have formed their own conspiracies concerning Kennedy’s innocence or guilt. To this day, the entire truth is unknown but that does not stop people from forming opinions and their own versions of the truth. 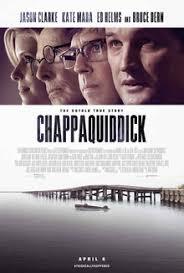 Chappaquiddick, directed by John Curran, displays the events that happened on the night of July 18, 1969. It demonstrates the events that happened behind spotlight. In my opinion, the movie was mediocre. It lacked depth and more insight into the story of Mary Jo Kopechne. It definitely attempted to paint Ted Kennedy in a better light. The movie was very one-sided and failed to capture all angles of the truth. Overall, the acting was good. I would recommend watching the movie but definitely not rely on it for knowledge of the truth. I would research more on the actual incident rather than form opinions based solely on the movie.